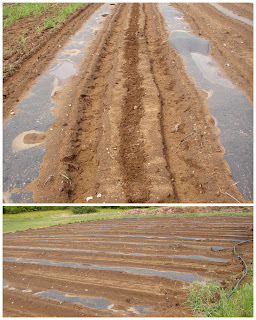 Although I have never used it myself, many farmers rely on plastic 'mulch' to suppress weeds, keep the soil warm, or both. The thing is, when you lay the stuff down, you have to leave almost a whole bed's width empty on either side, taking up valuable growing real estate - not to mention you are putting petrochemicals on bare earth. I am pretty strongly against the stuff.... however, when I pulled up some plastic that was over-wintered (Jenny helped!) I realized that is really does suppress weeds. Then a thought came to mind (Jenny helped! ): Why not plant in the beds that were covered last season, and cover the 'open' beds - killing the weeds that grew last year.